Inventors have claimed to have developed the world's first computer weather forecast system aimed at preventing road accidents in winter. 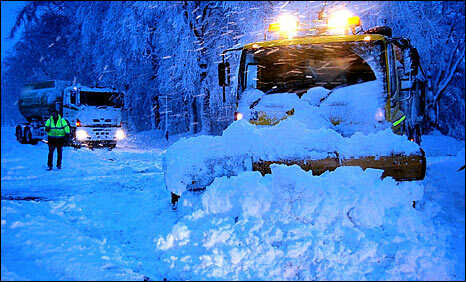 Academics said it would help councils improve road gritting efforts. RoadSafe has been developed by University of Aberdeen student Ross Turner and Banchory-based Aerospace and Marine International (AMI). It uses artificial intelligence technology and weather information to deliver the latest news quickly. The system has been piloted in trials, with positive feedback reported. Mr Turner said: "The aim of RoadSafe is to improve road conditions over the winter season by speeding up the delivery and enhancing the efficiency of the weather information which is passed on to council road maintenance departments. "The system is used to analyse the computer simulated weather forecast information and produce a draft forecast text. It uses what is known as natural language generation technology to break down the computer generated forecast into a standardised language where the same terminology is used every single time. "This summary is then passed on to the weather forecaster for editing and then issued to road maintenance departments." He added: "There are many potential ways in which this technology can help to further speed up the delivery of information to ground level road maintenance staff to make it as immediate and reactive to the weather as possible. "This includes text alert systems which would involve those actually operating the gritting vehicles receiving messages via their mobile phones to alert them to where they need to be operating during their shift as the weather develops." James Brownhill, director of business development at AMI, said: "There are many challenges in providing weather forecasts to, for instance, the general public, high risk industries like offshore oil exploration, or critical safety operations such as the prevention of ice on our highways. "One challenge is to provide accurate forecasts, and that is strictly in the hands of the meteorological community where massive numerical models of the atmosphere have had great success but these same models provide a huge volume of information. "Consequently the operational meteorologist is challenged with converting the model's numbers in a timely manner into a forecast that can be correctly interpreted by the end user." He said: "A forecast received late, or a forecast received but misinterpreted, can have fatal consequences with respect to gritting our highways. "Although there has been a tendency to present forecast weather information in graphical form - and this is preferred by the end user - research shows that the most accurate interpretation by the human brain is achieved through reading textual forecasts. "RoadSafe addresses all these challenges, the volumes of numerical model data, the speed of preparation of the forecast, and the presentation of the forecast in text and graphical form delivered to the user by a convenient communication channel."